Every visitor to Granduc was impressed by the remoteness of the mine and wondered how the orebody was ever located and explored. Granduc was near the Alaskan border in the Coast Range of British Columbia, about 600 miles north of Vancouver. An hour's flight northeast from Prince Rupert along the Portland Canal brings one to Stewart, B.C., an ice-free port. Twenty-four miles directly inland across rugged mountains, alongside glaciers and ice fields, lies Granduc. There is no really good season for prospecting in the area. In the short summer, a prospector had to fight almost continuous fog and rain. In the winter, he met bitter cold, snowfall of up to 960 inches in a season, and avalanches that could bury him and his claim in an instant. Nevertheless, prospectors, with characteristic indomitability, explored the area in the late 1920's. One man who camped near the Leduc Glacier in the summer of 1931 noted copper mineral showings, but reaching the area on foot was such a problem that no one showed real interest in the find for nearly twenty years. However, in 1948, a prospector named Einar Kvale staked some claims in the Leduc area. Three years later he was back again, this time working for Helicopter Exploration Company Limited, a pioneer in the use of helicopters for prospecting. 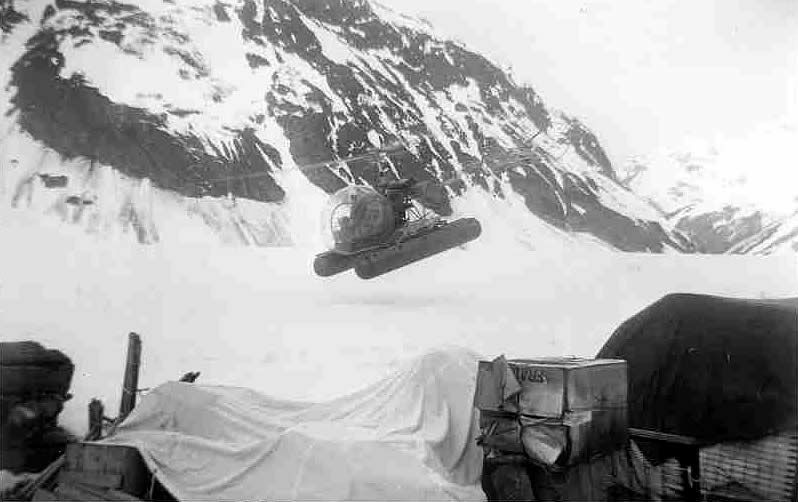 Kvale and a man named McQuillan staked claims that year, and again in 1952, all on behalf of Helicopter Exploration. Much of the Tide Lake region remains glacier-covered year around. This the Berendon Glacier just below the concentrator site, taken in summer of 1967"By that time, Granby Mining Company Limited, a copper producer in British Columbia, had heard of the staking and in 1952 arranged to send in a team of engineers and geologists who mapped outcrops of copper-bearing formations on both flanks of the Leduc Glacier and on the west side of the adjoining mountain. The next year, Granby took an option on the property and flew in drill crews and their equipment. The reports were so encouraging that Granby and Helicopter Exploration worked out a deal leading to the formation of Granduc Mines Limited to develop the property. The name is derived from Granby, the parent company, and Leduc, the river and glacier nearby. Granduc Mines then began a five-year program of exploration and development. A year or so later, Newmont Mining Corporation became interested in Granduc and negotiated successfully for a half-interest in Granduc Mines. Exploration continued for years. Airborne magnetometer surveys were flown and checked by surface drilling. Underground work was expanded, a shaft was sunk for deeper exploration, and eventually a part of the orebody was delineated. Mineable ore reserves were then estimated at 32,500,000 tons of 1.93 per cent copper. The bulk of the ore is in five major parallel, lenticular, steeply-dipping orebodies that are from 600 to 1,800 feet long, over 1,200 feet wide, and up to 120 feet thick. As copper mines go, Granduc's ore was fairly high grade, but was it high enough in grade and were there sufficient reserves to pay for mining the copper and delivering it to a market? Note that at this point, with the issue still in some doubt, some $6 million had been spent on the prospect. This is the kind of risk that is involved in mining, the courage and the faith in one's judgment to risk millions of dollars with no guarantee of eventual profit, or even of return of capital.